CHESAPEAKE, VA (Catholic Online) – In the last two weeks I have again been reminded of some memories of my childhood, reading Superman comics. I date myself by mentioning the Bizarro world. However, some of my readers will remember the strange upside down world of the Bizarro’s. The Bizarro World comes to mind as I watch the erosion of the moral foundation of freedom in the United States of America. I grew up believing that the United States of America, with its Christian roots, emphasis on a Natural Moral Law and recognition of inalienable rights which come from God, was a beacon for all Nations. In particular, for those Nations which had succumbed to the lies of atheistic Marxism. That included Russia, once the greatest proponent of atheistic communism. I still hope this is the case. However, we have clearly lost our moral compass as a Nation. Sadly, the leadership of our Nation, rather than pointing the way out of this collapse, seems to be compounding the decay. Some recent news coming out of Russia reminded me of those Bizarro comics. We seem to be living in an upside down world these days. I do not suffer from naiveté. I know that the situation in Russia is ripe with its own problems. I am aware of the continuing threats to fundamental human rights people in that Nation face. Rather, what I am pointing to is the language being used by its leaders, secular and religious, in diagnosing the root of the problems facing the Russian Nation, and proposing a path to cultural renewal. A path which leads through a recovery of the moral values found in faith in God. Let me give two recent examples. Today, many nations are revising their moral values and ethical norms, eroding ethnic traditions and differences between peoples and cultures. Society is now required not only to recognize everyone’s right to the freedom of consciousness, political views and privacy, but also to accept without question the equality of good and evil, strange as it seems, concepts that are opposite in meaning. This destruction of traditional values from above not only leads to negative consequences for society, but is also essentially anti-democratic, since it is carried out on the basis of abstract, speculative ideas, contrary to the will of the majority, which does not accept the changes occurring or the proposed revision of values. We know that there are more and more people in the world who support our position on defending traditional values that have made up the spiritual and moral foundation of civilization in every nation for thousands of years: the values of traditional families, real human life, including religious life, not just material existence but also spirituality, the values of humanism and global diversity. Sitting in the front row, in a place of prominence, was Patriarch Kirill of the Russian Orthodox Church. 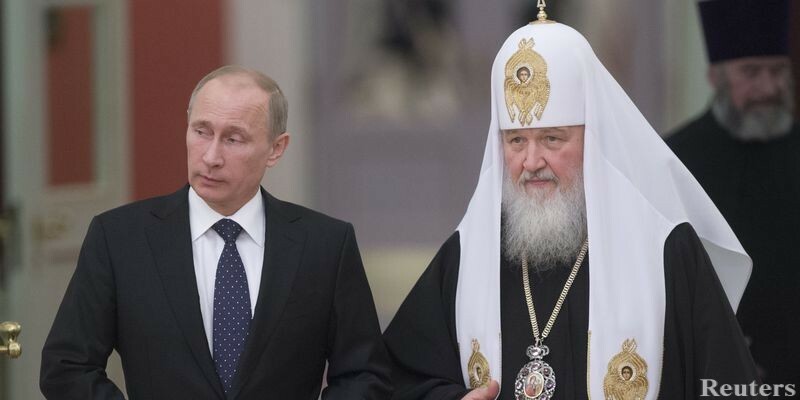 Putin now regularly professes his Orthodox Christian faith. He looks to the Patriarch for spiritual leadership and input on moral issues. I know, some cynical observers question this profession of Christian faith by Putin. I leave room for anyone to find the truth which is revealed in the Gospel of Jesus Christ; including former KGB officers. However, there is little doubt that the Orthodox Church is now resurgent in Russia. In fact, Christianity is growing and its influence is spreading. Patriarch Kirill is the 6th Patriarch of Moscow. He is theologically and doctrinally solid – said to be a man of deep faith and courage. He is a champion of the authentic Orthodox Christian Tradition and a stalwart defender of the doctrine of the ancient Christian Faith of the First Millennium – before the first split in the Church occurred. He is outspoken in his concern over the moral decline in Russian, European and broader western culture. He is also dedicated to doing something about it – leading a resurgence of authentic Christianity and a new missionary undertaking to Russian culture. Since his enthronement, Patriarch Kirill has offered his voice of clarity and authority to the growing Catholic and Orthodox critique of the decline of moral values and the hostility of the contemporary culture toward the Church. Please, name the main threats for Russia. Patriarch Kirill – I think that the main threat for Russia is loss of faith, rejecting faith as people’s conscious choice. Not under pressure as in the Soviet times, but voluntary contempt of the Heavenly Kingdom for the sake of vanity and illusionary attractions of the earthly kingdom. Unfortunately, there are signs of this process. For the sake of comfort and joys people refuse following moral norms. Thus, gradually, limits of sin and righteousness are washed away. And what was considered unworthy of a person: alcoholism, drug-addiction, lust, prostitution, homosexuality become norm. Society has always suffered vices, but today as in times of Roman and other civilizations decay they were considered socially approved. In result the institute of traditional family is collapsing. Rooted in sins, man lives in passions and doesn’t want to hear a sermon about Christ as acceptance of the Gospels commandments demands him to reconsider his behavior, to change himself, to make a spiritual effort to overcome imperfection. Eventually, there’s a real danger of rejecting Christ, rejecting the Orthodox faith. If it happens to us, we can speak about the end of our national history. If there’s no faith – there’ no Russia. And “faith without works is dead” (James 2:26). We are especially urged to remember it when celebrating the Nativity of Christ and I congratulate you on the feast. The Nativity of the world’s Savior is the event that has changed the history of humanity – it is an example of divine indulgence to people, to all of us. Let us, following the Lord Jesus Christ, share joy of the feast with those who need help. Our Christian joy about Newly Born Divine Baby won’t be full, if we don’t extend the helping hand to those, who need it. As we approach the celebration of Nativity of the Lord, let us pray for the United States of America to recover the moral roots of her freedom. That will only come by turning back to God who is the source of freedom. Let us pray for the conversion of those in leadership in the United States. Let us lead the way by living our own Christian faith in a compelling and courageous way. Let us also pray that Russia can find the path to freedom in God.